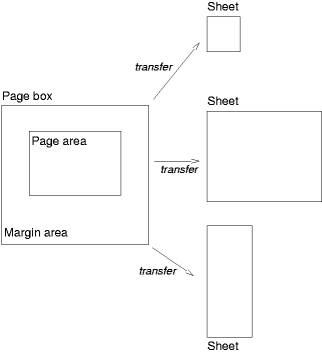 Authors can specify the margins of a page box inside an @page rule. An @page rule consists of the keyword "@page", followed by an optional page selector, followed by a block containing declarations and at-rules. Comments and white space are allowed, but optional, between the @page token and the page selector and between the page selector and the block. The declarations in an @page rule are said to be in the page context. Note: CSS level 2 has no at-rules that may appear inside @page, but such at-rules are expected to be defined in level 3. The rules for handling malformed declarations, malformed statements, and invalid at-rules inside @page are as defined in section 4.2, with the following addition: when the UA expects the start of a declaration or at-rule (i.e., an IDENT token or an ATKEYWORD token) but finds an unexpected token instead, that token is considered to be the first token of a malformed declaration. I.e., the rule for malformed declarations, rather than malformed statements is used to determine which tokens to ignore in that case. If a forced break occurs before the first generated box, it is undefined in CSS 2.1 whether ':first' applies to the blank page before the break or to the page after it. A conforming user agent may interpret the values 'left' and 'right' as 'always'. The 'orphans' property specifies the minimum number of lines in a block container that must be left at the bottom of a page. The 'widows' property specifies the minimum number of lines in a block container that must be left at the top of a page. Examples of how they are used to control page breaks are given below. In the vertical margin between block-level boxes. When an unforced page break occurs here, the used values of the relevant 'margin-top' and 'margin-bottom' properties are set to '0'. When a forced page break occurs here, the used value of the relevant 'margin-bottom' property is set to '0'; the relevant 'margin-top' used value may either be set to '0' or retained. Between the content edge of a block container box and the outer edges of its child content (margin edges of block-level children or line box edges for inline-level children) if there is a (non-zero) gap between them.